YET MORE UPDATES! Scroll down for new end-of-week photos, Johnny & Tara’s appearance (at last!) on NBC in primetime Friday night, new videos from People, the Today Show, Access Hollywood, and NBC Olympics, an all-new episode of the Tara & Johnny podcast, and new Hotel Olympics video plus music video from @TaraandJohnny! Johnny & Tara getting ready to go live on NBCSN Monday with Dan Patrick. Screencap from the broadcast. More fabulousness below! How did they do it??! Because they’re Johnny & Tara, of course. Any excuse to use this BGJW classic. Any excuse at all. So their first few days in Rio, NBC tried sticking baby in a corner with Snapchat. But on their own, back at their hotel, classic Glitter Twin hilarity ensued . . .
Also viral: Johnny’s fashion statements . . .
. . . and their new podcast, now ranked in the Top Ten among sports podcasts on iTunes, and named as one of the best Rio podcasts by The Guardian. Yahoo Sports: Are 450,000 Rio Olympic Condoms Actually Enough? We Asked Athletes Yes, ten years after his first Winter Games, Johnny — both the lead paragraph in this article, over actively competing Summer Olympians Danell Leyva and Ryan Lochte, AND the closing paragraph — is still the best quote at the Olympics. With NASCAR’s Rutledge Wood, who worked with them at this year’s Kentucky Derby. The cool kids covering the Opening Ceremony in the bar on Snapchat. See their full commentary in this post. With Granddaddy Brokaw at the end of the night. Glammed up post-Facebook Live on Saturday. See their first two live chat sessions here. With Golf Channel’s David Feherty. With WPXI Pittsburgh’s Damany Lewis . . .
. . . WBIR Knoxville’s Robin Wilhoit . . .
. . . and five-time Olympic medalist Sanya Richards-Ross. Backstage before appearing with Dan Patrick. Photo by Anne Marie Tiernon of WTHR Indianapolis. Note Rutledge to the left and Tara in the background. With diving Brits Daniel Goodfellow and Tom Daley. With KARK Channel 4’s Aaron Nolan. Wednesday afternoon glam. I always think he looks fab, but this is AMAZING and I love it so much! But little did I know . . .
. . . that this was actually his fishing gear. So apparently they did some fencing which obviously we’re dying to see . . .
NEW! And to close out Thursday: another outrageously funny Hotel Olympics video from @TarandJohnny. And look who Johnny finally met today . . .
New Glitter Twins music video! And also: they’re on in primetime tonight! NEW!! FINALLY: Johnny & Tara on NBC in primetime Friday night! NEW! Johnny & Tara with Brazilian designer Lenny Niemeyer. NEW! 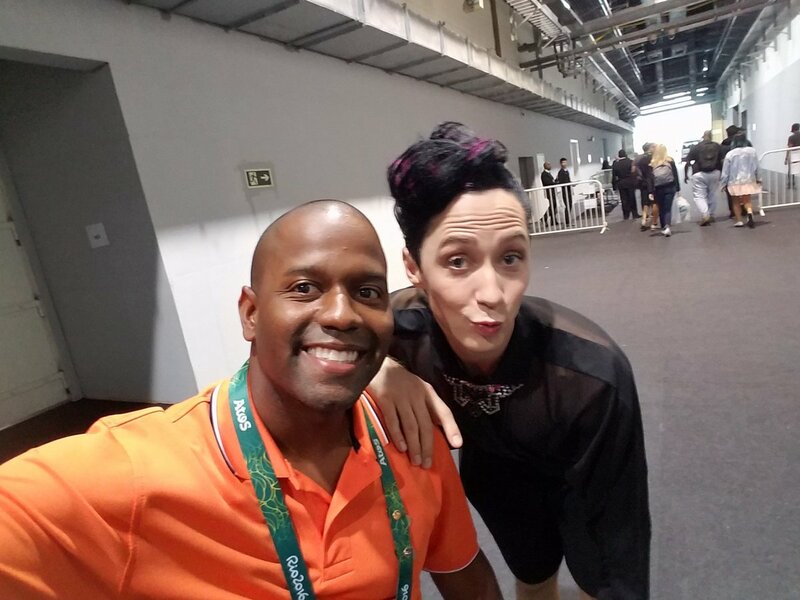 Johnny & Tara’s appearance on the Today Show to discuss viral moments from Rio. NEW! Johnny & Tara’s appearance on the Olympic Zone Thursday night with the NFL’s Dhani Jones. NEW! Teaser from the Today Show of Johnny’s fishing trip with Billy Bush. NEW! And the full segment from Access Hollywood. NEW! Johnny’s call-in interview with WMMR radio’s Preston & Steve Show in Philadelphia, in which he offers his take on the raging pie vs. cake controversy. NEW! Johnny & Tara’s video from People their visit to the studio of Brazilian designer Lenny Niemeyer (pictured above with them on Instagram). Facebook Live from Sunday 08-07. See their previous Facebook Live segments in this post. AND: discussing fencing with Dan Patrick on NBCSN. 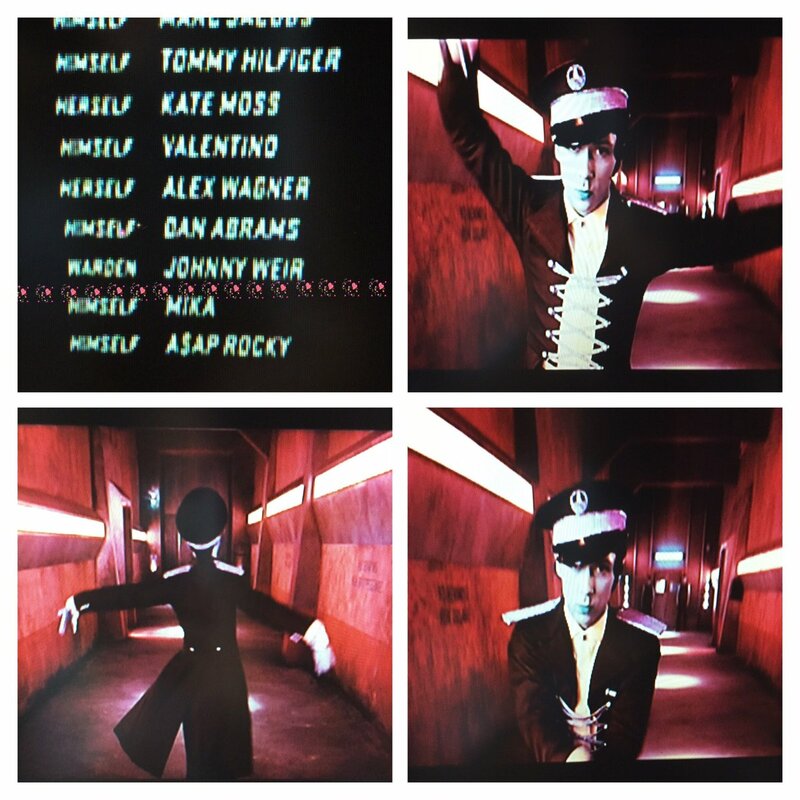 Still desperate to get his Zoolander 2 credits appearance as a gif. UPDATE! The gif! With special thanks to the commenter below. Very special thanks to video ninjas Jenn Kittler and Elena Vasileva for their invaluable help! ← #TaraandJohnnyTakeRio, Week 3,852, Or: Is It Winter Yet . . . ? Uncle Terry is in Rio – he’s out at golf. He’s covering men’s and women’s – starts Thursday. I hope Johnny & Tara swing by, especially since they’ve now met Feherty – it will be gossip time. It is so great to see them everywhere!